After the lighsaber fight in the cantina, Luke and Obi Wan sit at a table with Han and Chewie to negotiate passage to Alderaan. Imperial troops enter the bar, Han says "looks like someone's interested in your handiwork...," and we see the troops moving around the bar towards the table. When the camera pans back to the table, Luke and Obi Wan are gone. Where did they go, and how did they do it without being seen by the stormtroopers? They went out of the Cantina's back entrance. His new passengers turned to look, the kid about jumping out of his skin as the barkeep pointed toward them. It was left to Ben to drag the kid off into the shadows, pulling him toward the back entrance. By the time the stormtroopers looked again, they were gone. The next time we see them they've walked around the outside of the Cantina back to the front entrance where they meet up with C-3PO and R2-D2 who've been hiding in the 'Used Droid Lot'. Why did Obi-Wan lop off Ponda Baba's arm? 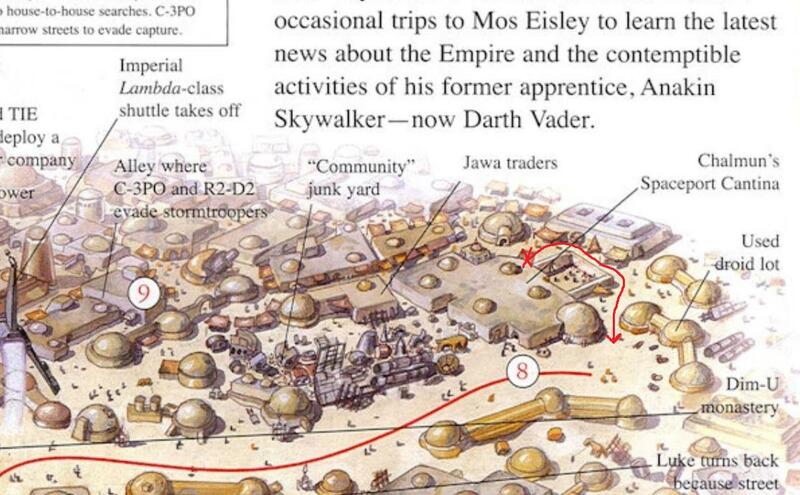 If the Empire wanted to rule through fear, why did they cover up the deaths of the Jawas on Tatooine?